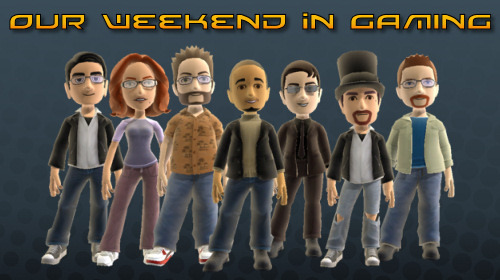 It's a weekend of cookouts and fireworks in the United States, but that won't stop most of us from gaming! Nick "bapenguin" Puleo - "I plan to put some time into Trine, Sins of a Solar Empire and maybe some Mercs 2 on 360. " Marc "DjinniMan" Allie - "I should be home for most of the day tomorrow, and I am looking forward to playing Duels of the Planeswalkers with my youngest son. He wants to learn how to play it, and the co-op campaign will be a great way to teach him. I've also been itching to play some Left 4 Dead again, but I think I'll leave the little guy out for that one!" Katrina "ShadokatRegn" Pawlowski - "Holiday weekends mean a lot of out-and-about time, so I'll be snuggling up with my DS for some quality Phoenix Wright. While I'm around, though, Crackdown and Mercenaries 2 will be a lot of fun! Explosions on the Fourth of July!" Mike "pheriannath" Katsufrakis - "In addition to a planned analog gaming session, I'll be playing a ton of Trine"
Jason "OrigamiPanther" Love - "I picked up Force Unleashed this week and will probably continue playing through that in addition to Devil Survivor for the DS." Jim "txshurricane" McLaughlin - "Since my internet is having hardware issues, I'll be working on the Grand Theft Auto IV campaign, which I never did finish. Once I can get my self online with a decent stream, I'll be playing some Ghostbusters co-op, Call of Duty 4 with my brothers, and Mercenaries 2. I might even check out Left 4 Dead again, if the meetup thread stays alive." Loren "AgtFox" Halek - "Maybe play some Fight Night Round 4 or play some Wii with the wife. Other than that, I'll be enjoying my birthday weekend" Editor's note: Happy Birthday!